Do you want free baby stuff? We’ve compiled this Big List of Baby Clubs for New and Expecting Moms. You’ll get free baby stuff, baby samples, coupons, and more! 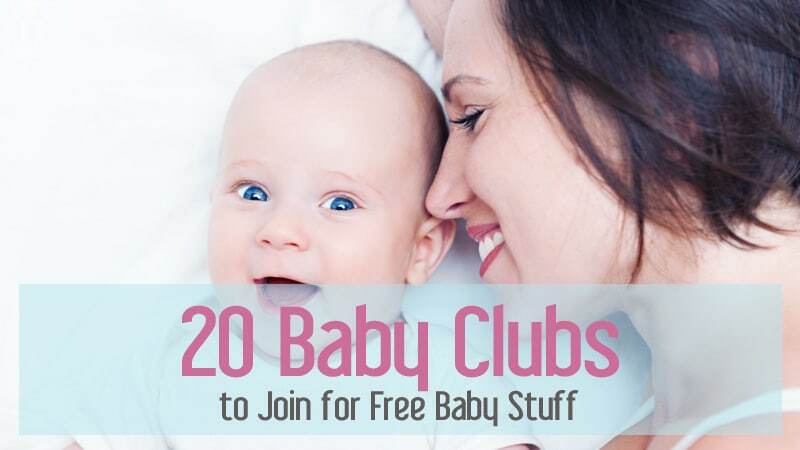 All of the baby clubs listed are completely free to sign up. So join these baby clubs today and start saving big! 1. Amazon Mom – Get a FREE Baby Welcome Box ($35 value) when you create an Amazon Baby Registry. You can also get a free 30 day trial to Amazon Mom. You’ll get 20% off diapers and wipes, 20% off household items, and a 15% baby registry discount. Plus, Amazon Mom members get FREE 2-day shipping! 2.BabiesOnline – Get free baby samples, coupons, magazines, baby contests, much more! 3.Babies ‘R Us – Create a baby registry at Babies ‘R Us and get a free gift bag filled with baby samples, coupons, and special offers. You’ll need to pick up your free gift bag in-store. 4.BuyBuy Baby – Create an online baby registry and get a free goody bag from BuyBuy Baby. The goody bag is filled with free samples and a 20% off coupon to use at your local BuyBuy Baby store. 5.Carter’s – Join Carter’s Celebration Club to receive a 20% off coupon along with mailings including special offers for their clothing stores. 6.Earth’s Best – Sign up for Earth’s Best newsletter to get special offers and printable Earth’s Best coupons. 7.Ella’s Kitchen – Get the Ella’s Kitchen newsletter to receive special offers and Ella’s Kitchen baby food coupons. 8.Food City – Become a member of the Food City grocery baby club. You’ll get monthly coupons on your receipt plus baby club even alerts. 9.gDiapers – Join the gDiapers community to get exclusive sales and special offers. They provide unique diaper covers with disposable inserts that are flushable and compostable. 11.Johnson’s Baby – Sign up with J & J’s Healthy Essentials to get printable coupons for Johnson’s Baby products and helpful baby care guides. You can also get a free Johnson’s Baby Relief Kit. 12.Motherhood Maternity – Print out and bring a voucher to your local Motherhood Maternity store to get a gift bag full of coupons and free samples. 14.OshKosh B’gosh – Join to receive a 20% off coupon along with mailings including special offers from OshKosh. 15.Pampers – Join the Pampers Rewards program to earn points for free stuff like free diapers, gift cards, magazine subscriptions, toys, more! New members get 100 FREE Points just for signing up! 16.Playtex Baby – Get special offers from Playtex Baby when you sign up for their Better Beginnings newsletter. 17.Store Brand Formula – Go to StoreBrandFormula.com to get printable coupons for store-brand formulas. You’ll get coupons from retailers like; CVS, Food Lion, Giant, Kroger, Rite Aid, Walgreens, Target, Walmart, more. 18.Target – Create a baby registry online and get a free Baby Welcome Kit from Target. The kit includes a free Munchkin Latch bottle, MAM pacifier, baby samples, and coupons. This is a $70 value! 19.Wal-Mart – Request free samples and coupons for baby and Mom from Walmart. You can also get a FREE Welcome Baby Box filled with full-size baby products. The welcome box is free, you just pay a flat $5 shipping fee. 20.Winn-Dixie – Winn-Dixie Baby Club members will receive special discounts, coupons, and gifts for you and your baby to enjoy throughout the year.